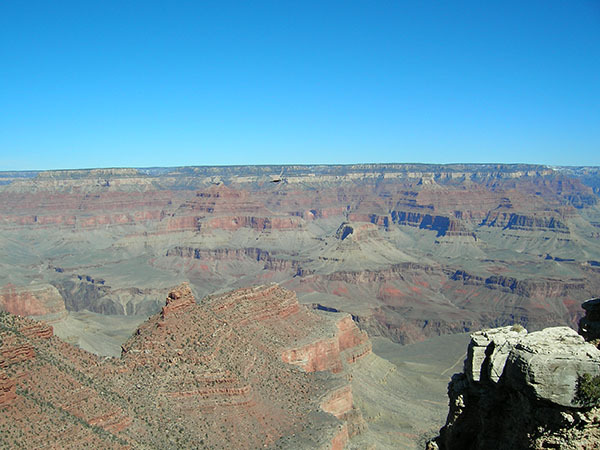 This morning we are heading off to the Grand Canyon so we go down at 9am for the complimentary breakfast which is much better than we expected. There were omelets, sausage patties, a variety of breads, cereals, coffee, tea, fruit juices and fruit. 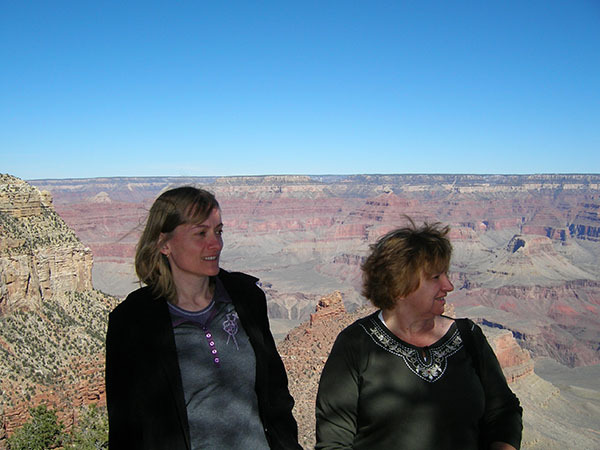 Once we have eaten we pack the car and head off from the Holiday Inn in Tusayan to the Grand Canyon a few miles away. 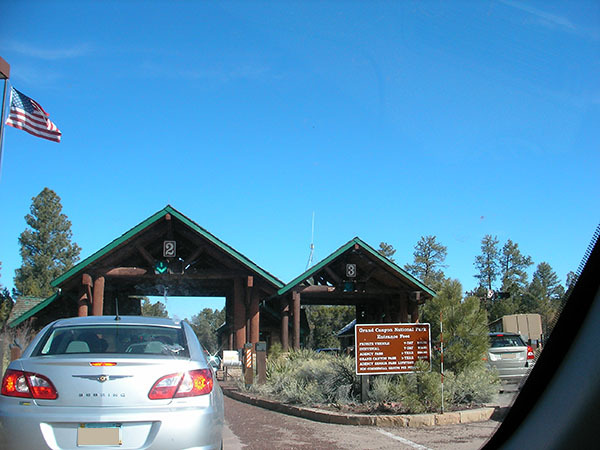 We stop at the toll gate and pay the $25.00 per vehicle park entrance fee. The fee for pedestrians and cyclists is $12 per person and the entrance fee is valid for seven consecutive days from the date of purchase on either rim. 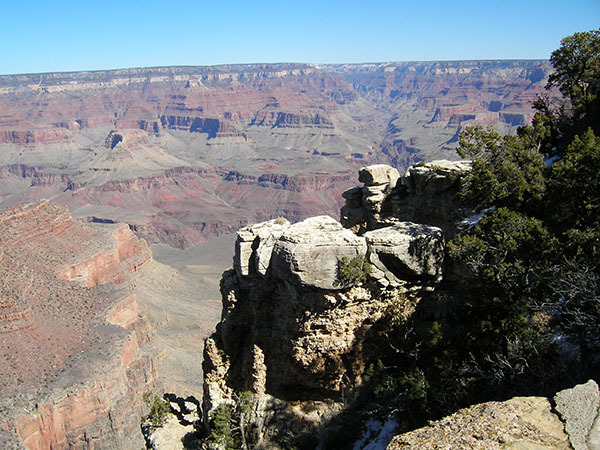 Which is really handy if you are staying in Tusayan because the seven day pass allows you to go to and from the Grand Canyon as often as you like. There is a separate drive through for anyone who has previously paid in the last seven days. Paula drives past the first few lookouts as we have decided to see if we can check in at our hotel first. 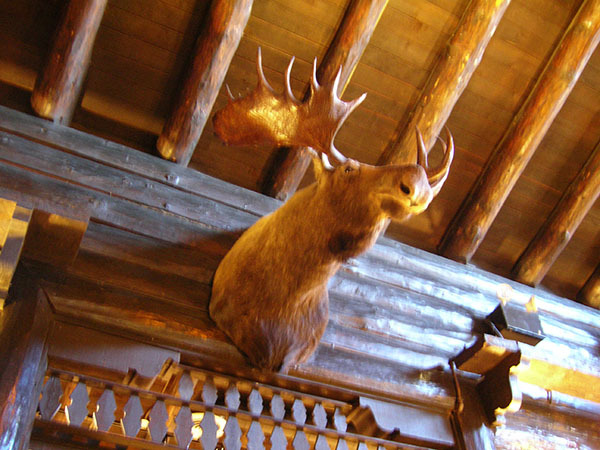 We are staying at the Kachina lodge but we have to book in at the main reception area in the El Tovar Hotel. 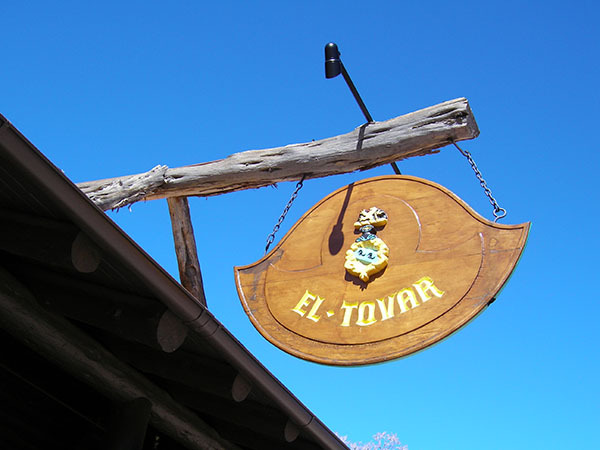 The El Tovar hotel sign. 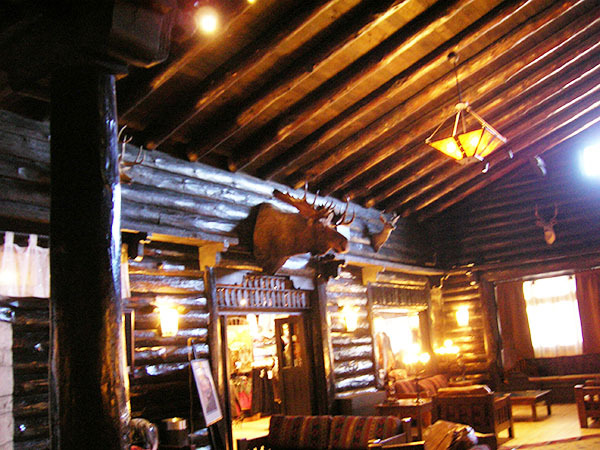 The interior of the El Tovar hotel is quite rustic looking. And the walls are adorned with the heads of various stuffed animals. 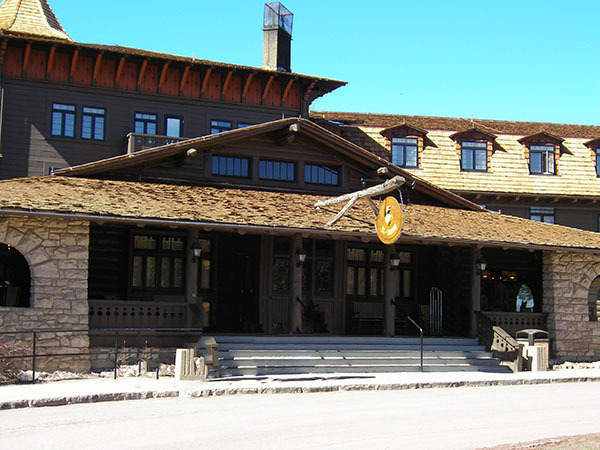 The hotel has hosted many presidents and celebrities at the hotel including Theodore Roosevelt, Albert Einstein, Zane Grey (author) , Elizabeth Taylor and Bill Clinton. When it first opened it was considered to be one of the most luxurious hotels situated between San Francisco and the Rocky Mountains and although the guest rooms didn’t have their own bathrooms, they all had a telephone. Back then there were also seperate sitting rooms for men and women, a photography studio complete with a darkroom, a wine room, billiards parlour and a rooftop garden. It was a challenge to get fresh food for the hotel so they built a milking barn for it’s herd of Jersey cows, a poutlry barn to provide fresh chicken, a butcher shop, cold storage facility and a bakery. Up until the 1930’s water was transported to the hotel by train. I am such a history buff and finding out all these fascinating facts is just so much fun. Book in is generally at 4pm and we are way too early at 11am. So we head outside to decide what to do next. The wind is blowing strongly and the temperature is 45 degrees F so although we are wearing pants that are reasonably warm, I only have on a cotton t-shirt, and open sandals, Paula isn’t dressed much warmer so we go back to the car and add a couple of top layers, some socks and closed in shoes. So take our advice and make sure you have warm clothes and waterproof shoes if you are coming late February, early March. Feeling a little warmer we go into the Hopi House which was designated to be a National Historic landmark in 1987. There are a lot of excellent authentic American Indian arts and crafts for sale and we only wish we had room in our suitcases. I almost weaken and buy some Turquoise earrings but finally resist the temptation. Paula picks up some arrows but we decide that she wouldn’t be able to take them back into Australia. The Hopi house and through the souvenir shops. 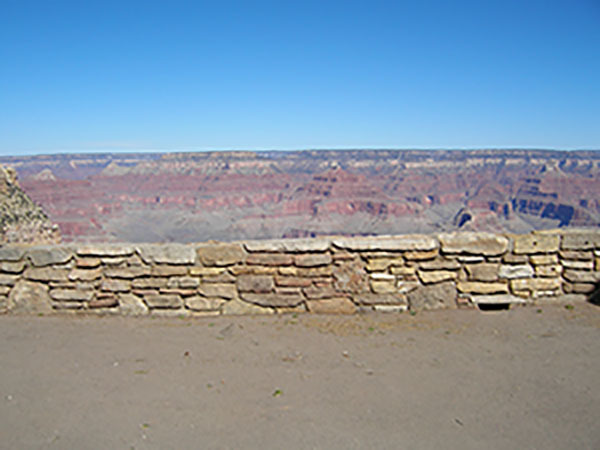 The Hopi house is a sandstone structure made in sandstone. 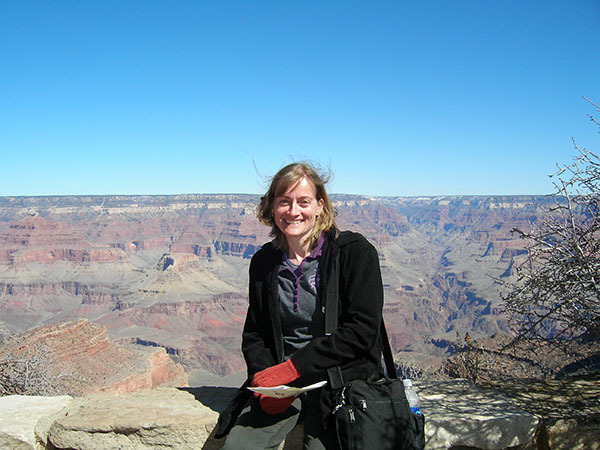 It was designed by Mary Coulter who was an architect and interior designer fot the Fred Harvey Company. 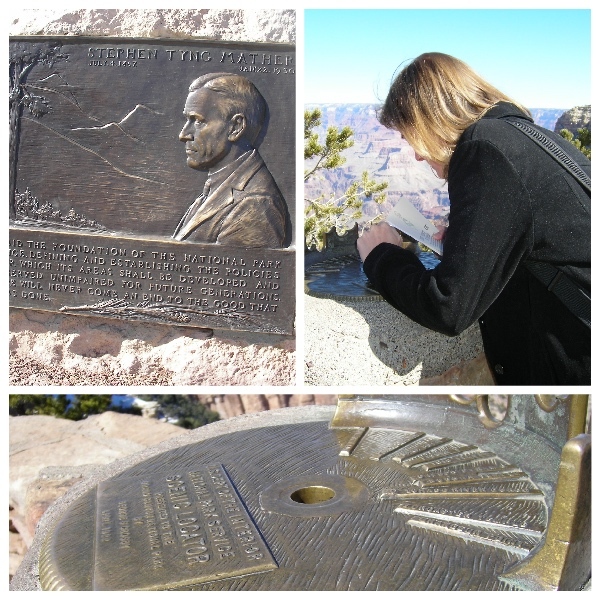 It was opened in 1905, just 2 weeks before the opening of the El Tovar Hotel which is just a short distance away. Hopi House was built to be a market place for Native American crafts, that were made by artisans on site. 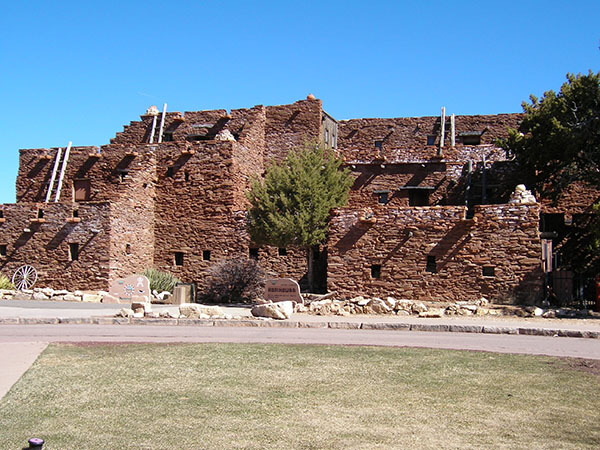 The building was designed to resemble a traditional Hopi dwelling. It is really interesting to learn the history of this building and to stroll around checking out the craft. 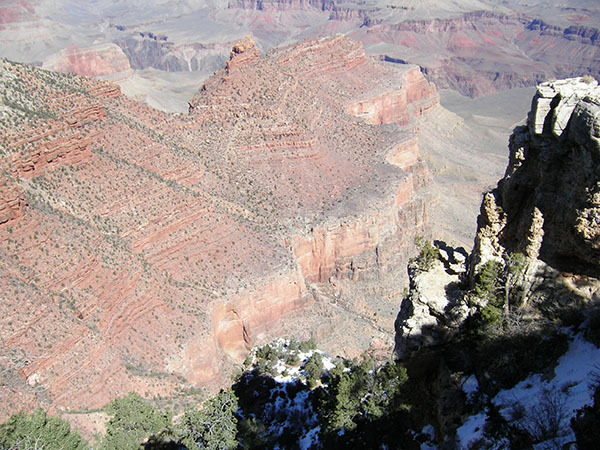 And then we stroll over and have our first look at the Grand Canyon. Getting excited walking up to look over the edge for our first real glimpse. WOW, what can we say, the sight is truly amazing and awe inspiring, there are just not enough superlatives to describe the view. This is a sight that has to be experienced to be appreciated; photos and movies just do not do the sight justice. The person we spoke to in Ash Fork being a local has perhaps grown used to being amongst one of natures wonders, because as good as the Imax movie is, nothing compares to the real experience. You can still see the snow on the areas in the shade. Teeth are definitely chattering, in this wind. Looking away was the photographers idea, not sure what we were supposed to be looking at. Not getting any warmer. But oh! that view. Amazing. 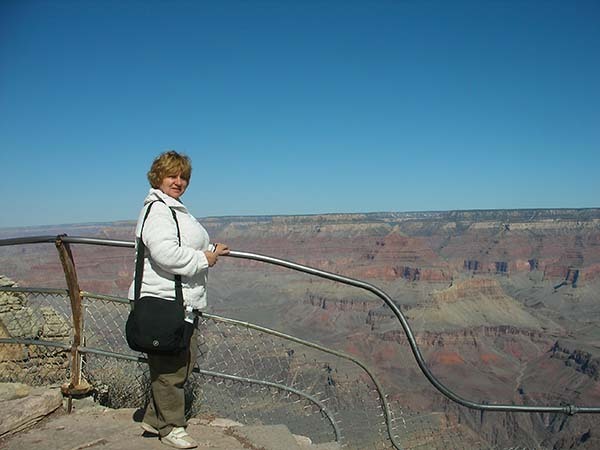 Paula checking out where things are on the Scenic Locator. Note: This post has been updated since it was first posted in 2008.